Come one, come all to the West Bay Invitational! I’ve been quite busy the last month with AHM (article coming soon) and my brothers wedding (Congratulations Sam and Delaine). With all that said this has been one of the projects I have been working on. 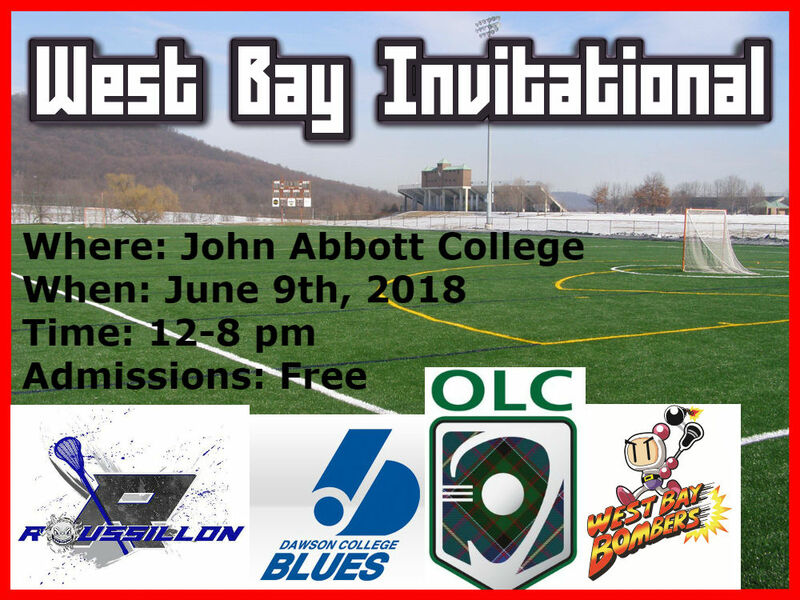 Who: Rousillion Rebels, Dawson Blues, Ottawa Lacrosse Club and West Bay Bombers Lacrosse Club. 7 minutes at the end to clear the benches after games. Round Robin format then 3v4 and 1v2. *Team Draws will be done live on Gone Laxing’s Facebook Page Tuesday June 5th,2018. Coming from the South Shore of Montreal. The Rousillion Rebel are here to show everyone they mean business. Dawson being a local Montreal CEGEP. This team sports players from the school’s lacrosse team and friends. The team manager I know has a pretty far reach for good talent. Do not take this guys too lighty or they will stun ya. Ottawa is a hotbed for field and box lacrosse, this team will be strong. These boys will be smart, talented and am sure they are making the 2 hour drive with one thing in mind. The host and local lacrosse club. The West Bay Bombers are a contingent of beauties looking to christen their first invitational with a win.